It's an old gag. You know the one about the surgeon who visits the patient to tell him that there is good news and bad news The good news is that the bad leg is getting better, but the bad news is that the good leg has been amputated! But my right leg has the problem! Yesterday I went to my sports masseur. 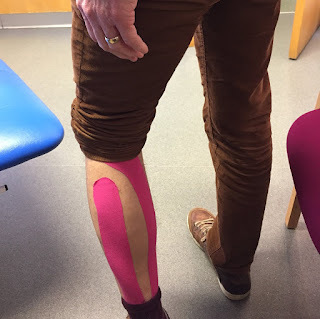 I'd been training for the London marathon and felt my right calf 'go' a few days ago. After running for 4 miles the pain in it just grew and grew, so I had to stop and walk back. The masseur was excellent and really hit the spot. At the end he suggested I had some of those rather trendy strips of tape applied to my calf. I'm not entirely sure if I was just relaxed or in a very trusting mode, but after the strips were applied to my leg it wasn't until I got to my car that I realised that the tape had been applied to the wrong leg! The masseur had worked for all the time on my right calf and then rather absent-mindedly applied the strips to my left! Perhaps I thought there was some kind of magical transference going on. It has made me reflect upon how trusting of the professional we all can be. And whilst trust is an essential part of the contract between patient and doctor, I do think it important that the patient should feel comfortable to ask if what is being suggested seems odd, or just simply wrong. In recent days I have heard a few stories of poor care in the NHS. And whilst it's easy to defend such events by claiming the system is under enormous pressure, I feel that whatever the stress of working in such a strained system we owe it to one another, that those off us working in the NHS should do our utmost. I've always tried to practice medicine in a way that would be good enough for my family and think it is no bad aim to bear that in mind with each and every patient interaction. Will we fail sometimes? Of course. Should we aim for perfection? Well no, because that its unattainable. But if I am a patient I do want to know that the health worker treating me is on my side, and is willing to have an open co-operative relationship with me. I often find myself saying to patients struggling with long term difficulties, 'I'm sure we can make headway together'. Instilling hope is such an important part of medicine, and that needn't mean giving unrealistic goals, and of course the patient has their part to play, but I do want to be alongside them cheering them on, answering their questions, empathising and sometime just being there.